In our factory we also offer Die Cutting for cardboard cut prototypes, POE stands and much more. With our in-house design department, we can design your product for you, make it and ship it to your door. 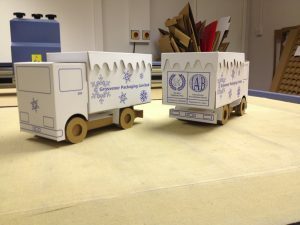 For more information on die cut cardboard, drop us an email or contact us on our contacts page. Call them Business Development Manager, Sales Executive or Sales Representative it all amounts to the same thing – and finding a good one isn’t easy! We’re all aware of the ‘usual suspects’ who flit from company to company and every year or so turn up at your door with a different business card in hand. Well here at Grosvenor Packaging we’re looking for someone different, a person of substance if you like. We’re looking for an open communicator, an ethical business-person, someone who can grasp the bigger picture of Grosvenor Packaging, rather than looking at what orders they can squeeze from their contacts that week. We would like to find someone capable of developing long-term, viable partnerships with end-users where both parties benefit. Someone who can maximise on our team of expertise and experience and ultimately become a strong part of that team. Of course experience is key but not necessarily in our field. Maybe this someone would be able to adapt easily into our business, for example they might already have dealings with lots of manufacturing facilities. I realise this approach is a little unconventional but those of you who have been through the frustrating process of reading a hundred generic CV’s from so-called specialist recruitment consultants, most of which are inappropriate, will understand the change of tact. At Grosvenor Packaging we’re not desperate to find a rep, we want to grow! And we don’t want to compromise on our quality of customer service in the process – or business ethics for that matter. If you know of anyone who matches the above requirements or even if you yourself are interested in talking with us about this opportunity please feel free to contact us, I assure that all enquiries will be treated with complete confidence. Written by stevemaz on April 24, 2013 . Posted in Blog. On 12th December 2012 Grosvenor Packaging’s longest serving employee Brian Ainsworth retired. Nobody wanted this day to come as Brian’s truly genius mind as a designer has played a huge part in the success of the Company. Brian agreed to remain working as a consultant designer for 2 days a week and has done so up to now. However circumstances have now persuaded him to finish work altogether and his last day working for Grosvenor Packaging will be tomorrow, Thursday 25th April 2013. Brian will be missed greatly by everyone who has been fortunate enough to work with him in any capacity during his years with Grosvenor Packaging. We all wish him a long and most fulfilling retirement. It is certainly the end of an era. Point-of-Sale Displays – A small counter-top display is proven to massively improve sales of your product. Customer ‘C’ once described themselves as a small cottage industry supplying their product on-line to end-users. With a bespoke counter-top display designed by Grosvenor Packaging supplied to a number of retail outlets in the UK their sales have more than doubled over a 2 year period! Increased All-Round Efficiencies – By optimising the pack size savings can be made all round reducing transport or storage costs and increasing packing speeds. Customer ‘A’ was packing an expensive piece of computer hardware into the best fitting box available to them, protected with a lot of bubblewrap. After Grosvenor Packaging assessed their packaging they now use a bespoke box with corrugated fittings, which not only protects the product better, it also takes time out of the packing process and reduces their courier costs!